I’m totally fed-up with this rain now – everything’s being battered and I’m desperate to go and paint outside. I did these cream roses before the next pumelling – pilfered from a friend’s garden while they’re away on holiday – with permission, promise! Anyway, it’s Childwickbury Arts Fair this weekend so hoping to see some of you there. Don’t worry about the weather it’s mostly in marquees and there’s always lots to do and see – all artists demonstrating. Loads of good music and scrumptious food. Hope to blog but don’t hold your breath……..always completely whacked when I get home each evening. 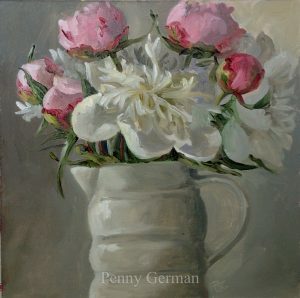 I’m just cramming in this peony practice whilst they’re still around – it won’t be for long. I just love the seasons and the way each one gives up some new booty. What an amazing planet we live on. I’m hiding in my studio today, just a little shell-shocked and wondering if it’s safe to come out. I don’t know what’s in store but I’m just going to keep wielding my brushes and stay calm. Here are some bluebells I’d forgotten about. Just a quickie today. Busy, busy. Ok, enough already. Enough rain, enough referendum…..time for some sunshine and a change in the news if you please. I have a lot of studio work going on so in some ways, the rain is keeping me from wanting to paint en plein-air so it’s not all bad I suppose. When I get this all done I shall be out there in fair weather or foul. You can’t beat the British countryside in the summer. In the meantime, more demo work……. 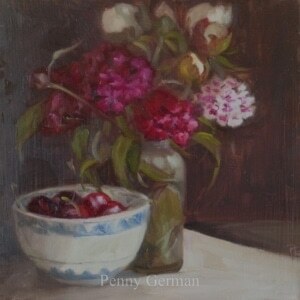 This one was painted as a demo at Patchings last week. 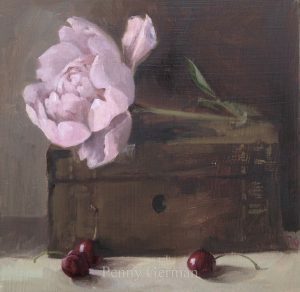 The peonies are still in bud form and refuse to open. I think it must be the weather so I sympathise. Woke up to sunshine this morning but now that blanket of cloud is back grrrr. No rain at least. I’ve been working on a larger painting today so here’s a painting from the last workshops. It sold at Patchings the next week. Thank goodness the sun’s come out but the downside is the pollen has too! Never happy. Well, it was very hot and very busy at the CAS private view yesterday evening but a great crowd and a lot of fab work. If you get a chance to go over the weekend, I’d recommend it. There are some great pieces by some of our best artists so it was an honour to be hanging near them. Anyway, here’s another demo piece done at workshops last week. Same subjects, just moved around a bit!! Have a wonderful weekend – it sounds as though the weather might just cheer up. I’m off to London today for the pv of the Chelsea Arts Society and hope to catch the Affordable Art Fair on the way. Taking the brolly! Here’s one I made earlier. Have a great day. 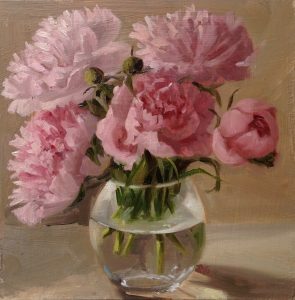 It’s full-on peonies this week. I have one lone peony in my garden that I planted about six years ago and it’s the first time I’ve ever seen a bloom. However, the lack of sun means that it remains a tight orb so far. Arrested development due to inclement weather.